We have quite the fun parrrrrrrty to share today! 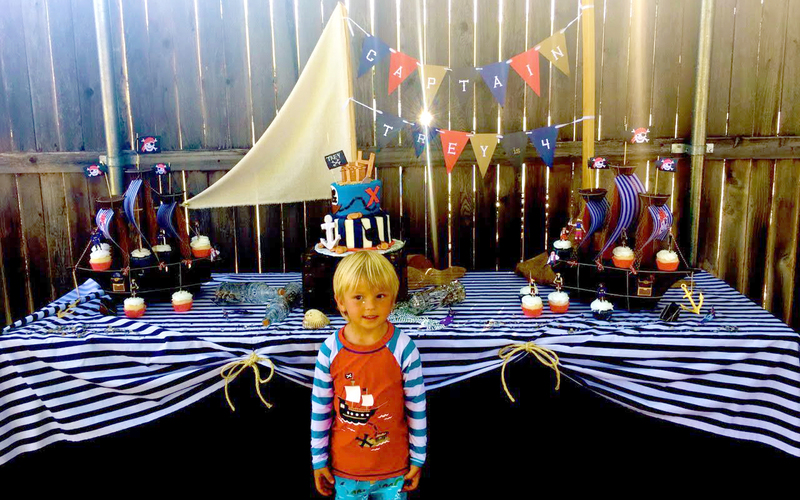 One of our favorite little clients turned four earlier this summer, so we helped him celebrate in style. 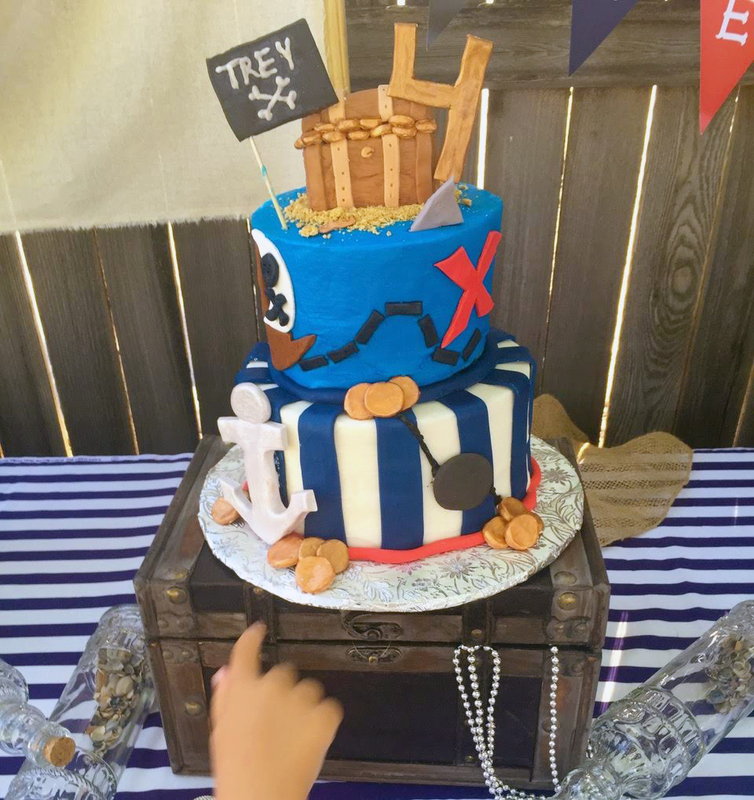 Trey's mom always goes above and beyond in creativity when throwing his birthdays, so you can imagine our excitement when she told us that this year Trey was having a pirate party!! 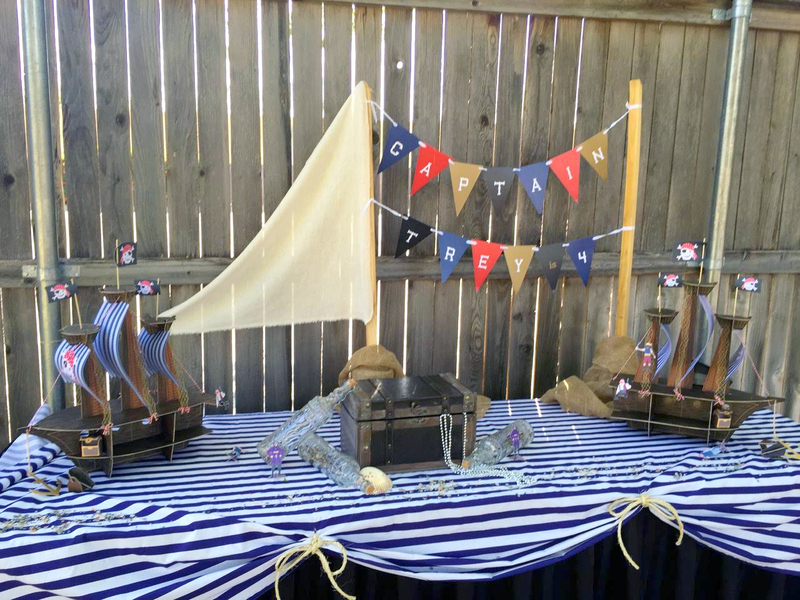 Take a peek at some of the awesome swag (and the treasure map party invitations) we helped create below! 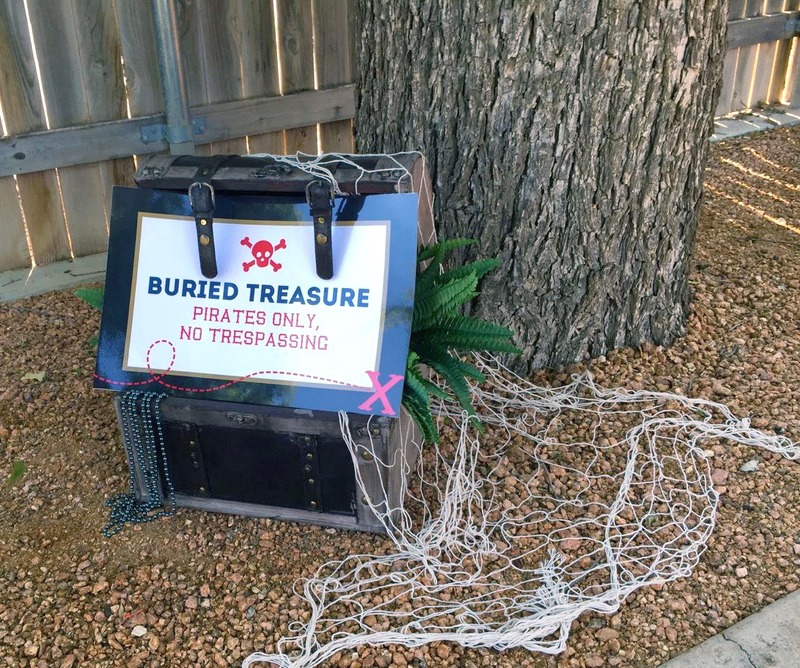 What do pirates do best? 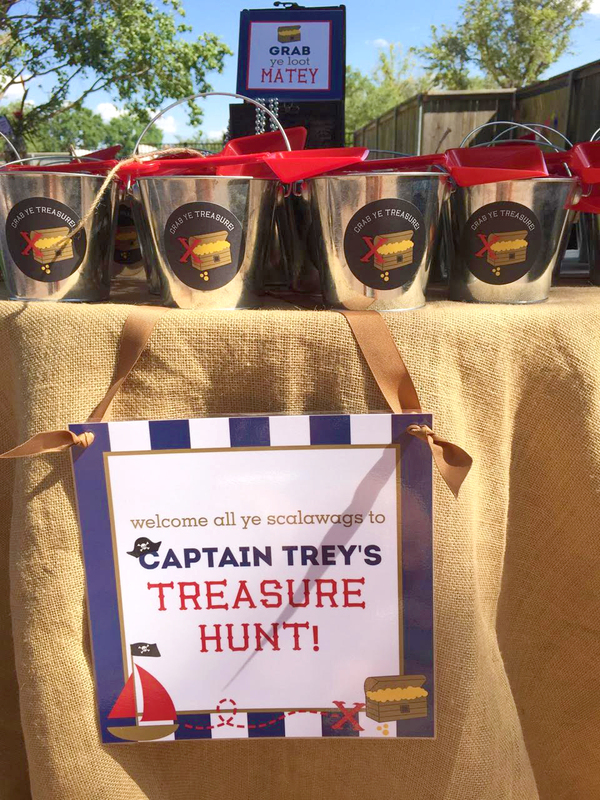 Hunt for treasure, of course! 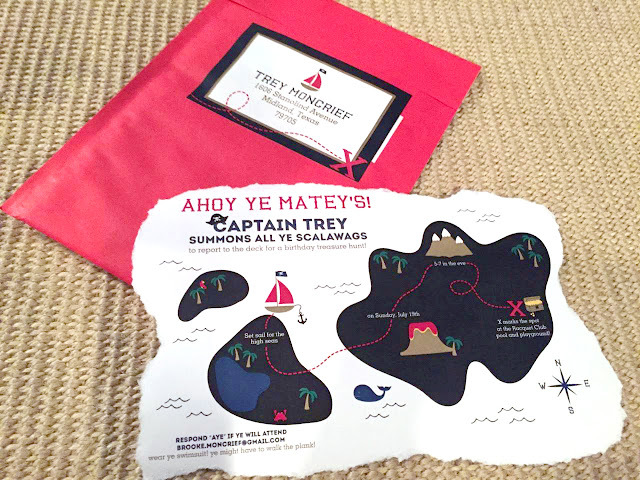 So for Trey's pirate birthday invitations, we created a treasure map! 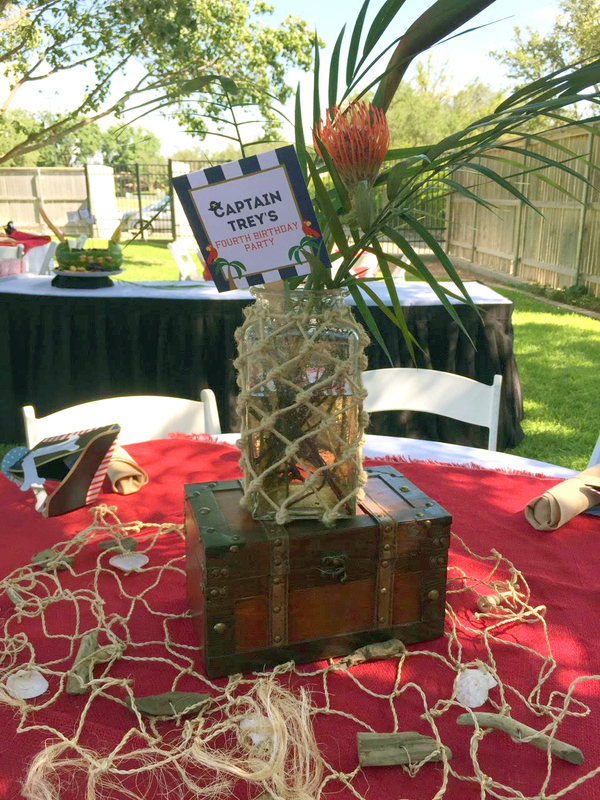 Each map detailed the time and place that his scalawags could celebrate with the captain. 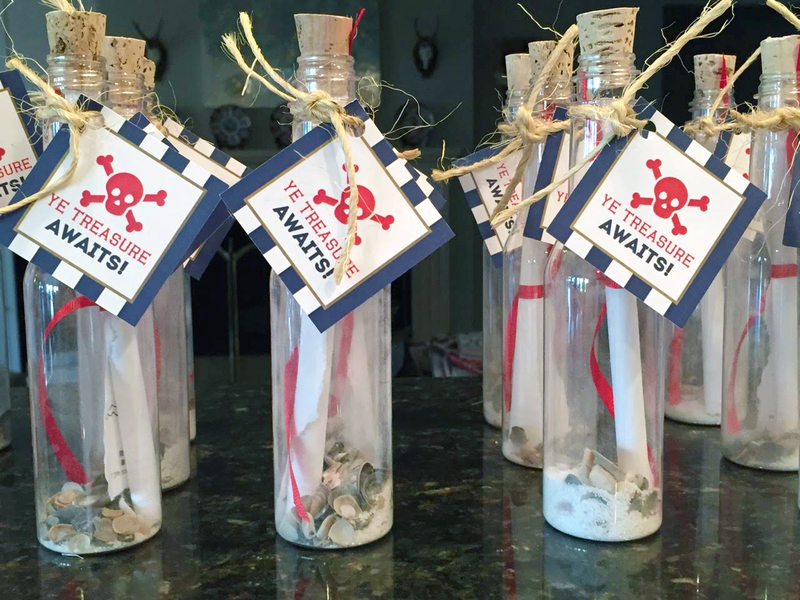 The treasure maps were rolled up inside a bottle, and were stuffed with sand and seashells! Party guests received sand pails to help them grab their loot during the treasure hunt! 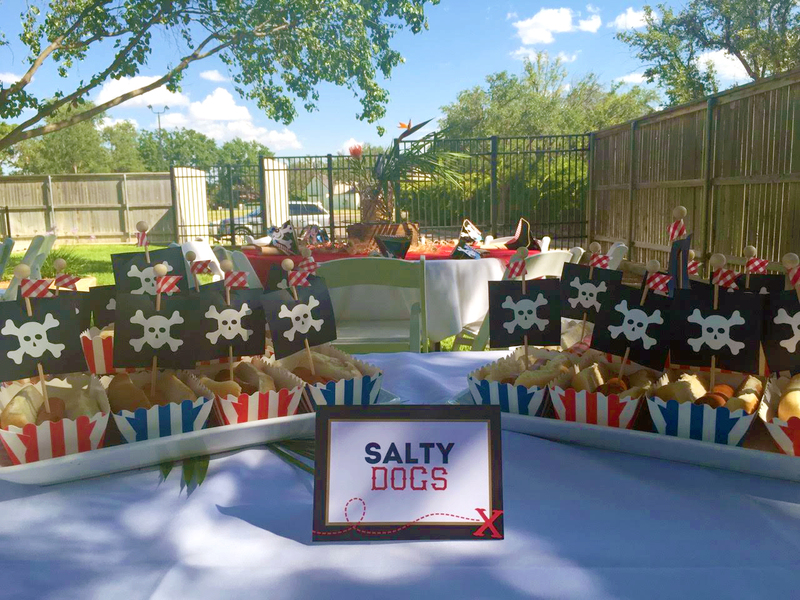 Could these "salty dogs" get any cuter?! 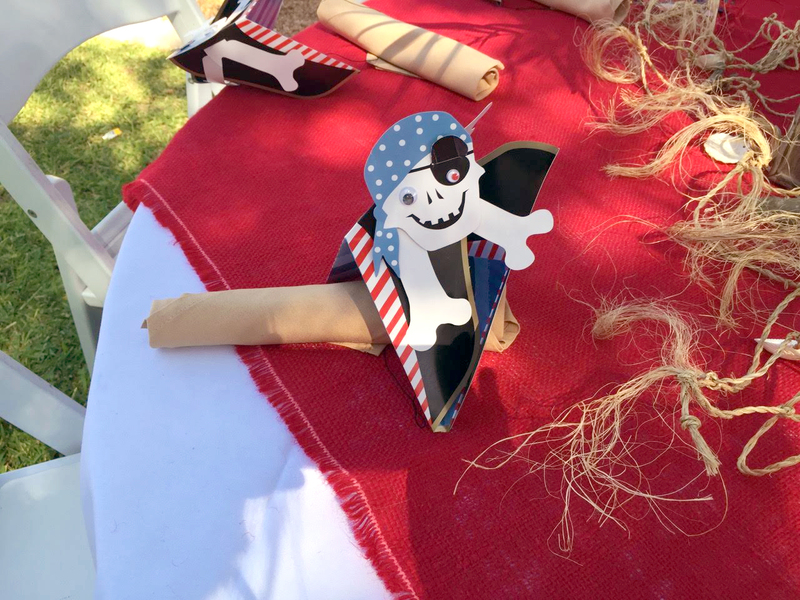 We love the pirate flags stuck inside the hot dogs! X marks the spot on the birthday cake! All of Trey's party guests received treasure chests at the end of the party!! So cute! 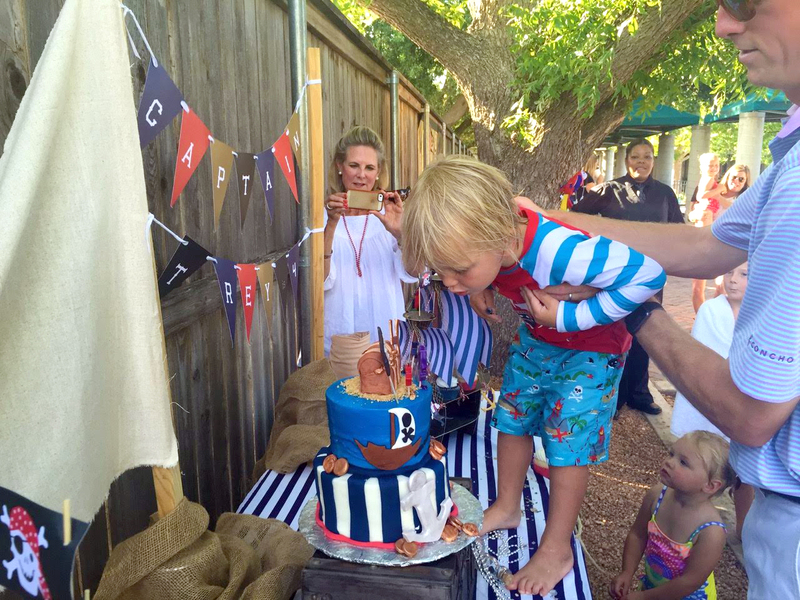 Happy fourth birthday, Trey!! So happy we got to celebrate another birthday with you! Be sure to check out Trey's past birthdays for some party inspiration including his golf par-tee, fun farm animal birthday, and his nautical first birthday! We have a super special blogpost today to celebrate summer, sun, and fun! 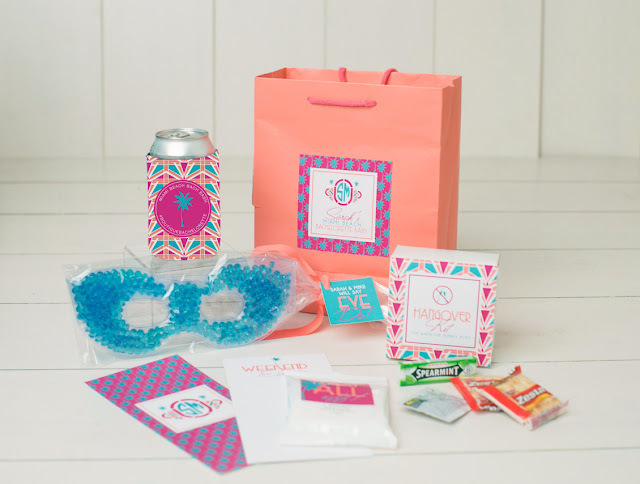 As many of you know, we recently launched Boutique Bachelorette offering some super cute bachelorette swag that you can order directly online! In our designs, we focused on some popular bachelorette destination cities...one of which is one of our all time faves, MIAMI! We also are kind of OBSESSED with the "Florida" themed bachelorette swag bag design as well..It's got a little Miami mixed with a little Lilly Pulitzer...just our speed!! 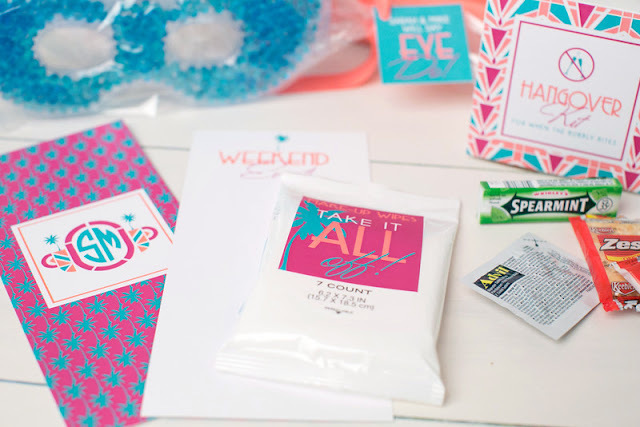 Anyway, so you've got the swag bags down for all your girls...so we thought not why not share some of our favorite activities, restaurants, and things to do! If you follow us on Intagram, then you know we frequent South Beach quite often, so here is a little list of all our favorite Miami Hot Spots that we think would be perfect for a South Beach Girls Weekend or Miami Bachelorette Party! The Delano is a 100% must see hotel with magnificent interiors and white on white decorating scheme, which allows purchase of a day pass for the pool only on Sundays. But we prefer it mainly for cocktails at the outside back bar. There is a very lively night scene and you get a little bit more pomp and sophistication with lounge seating and cabanas, rather than the scantily clad nightclub scene Miami is often known for. Recommended for Thursday, Friday, and Saturday nights although any time we are in town, we find ourselves right back HERE any night of the week! Remember when we said scantily clad night clubs? Well then you have the Rec Room. The Rec Room is located directly across Collins Avenue from The Delano and below the Betsy Hotel. Don't let the facade of a plain stucco wall fool you...it is full of late night shenanigans and fun, and recommended after one too many cocktails at the Delano. The clientele is more upscale than other clubs, but lets be honest, it is still a club that opens at 2 am (give or take)! 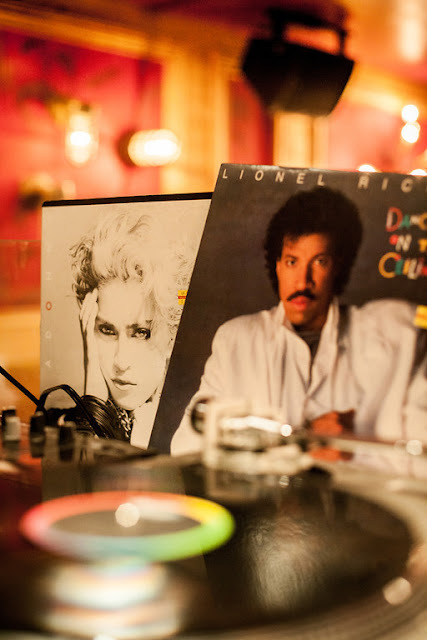 They also have incredible DJs that play the best old school mixes combined with current hits. Think Beyonce mixed with Toto. It's AHHH--MAZING. The Matador Room is located inside the Edition Hotel and is a see and be seen type of place. They have phenomenal food (it's a Jean-Georges restaurant) with a great party atmosphere. After dinner head down to the Edition Night Club where they offer bowling, of course dancing, and even ice skating! Ocean Drive is filled with tourists from all over and every restaurant you walk by will harass you with some sort of 2 for 2 special and drinks the size of your head. It is FANTASTIC people watching and your jaws will drop. We recommend The Clevelander for bar food and a dose of Lady Gaga type girls dancing while you eat potato skins after a long night out. For us southerners, this restaurant is a little home cooking mixed with a Miami trendy vibe and fantastic cocktails. We highly recommend the shrimp and grits and fried green tomatoes with pimento cheese..need we say more? A great place to start the evening before a night of partying! SLS is one of the larger hotels on Collins Avenue and is right beside number one on our list, The Delano. We have heard there is a big pool party scene here if you are into that (we are not)! Sunday is supposedly the day to go and get bottle service by the pool. We prefer the Hyde Nightclub which we are a little too old for, but with our shoulders back and stomachs sucked in, we can slide right in on a good day! HA! Big Pink is where everyone in South Beach crawls to in the morning, or late night for that matter. It is big, and it is pink, and the meals are enormous. 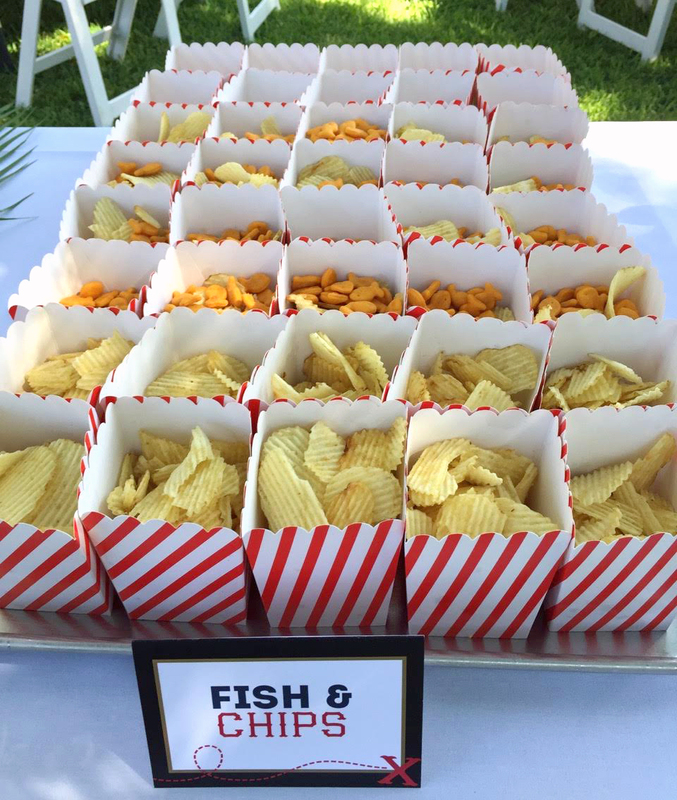 We recommend splitting items, and they have something for everyone. You will definitely have to wait on the weekends, but trust us...it is worth it. They have great delivery (in pink VW bugs..so fitting) as well, and are open 24 hours. The Standard Hotel & Spa is a hotel known for its day spa and pool area. We recently discovered that if you get a spa treatment over a certain amount (I believe it is $150), then you get a free pool pass for the day. They have lounge chairs everywhere, drinks out of coconuts, and the spa is AMAZING. 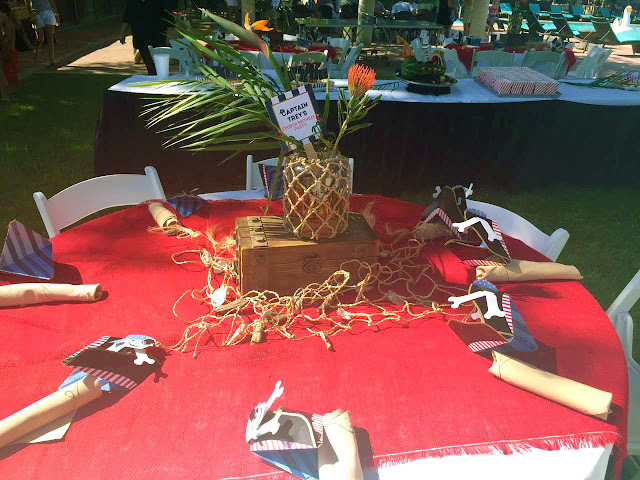 There is also a lunch spot by the pool that is fabulous for after your facial or massage! Rose all day! Espanola Way has an atmosphere solely its own, when it comes to Miami. It is a little Spanish style, cobblestone area just off of Washington that is pedestrian only. Our favorite spot is the Italian restaurant, Hosteria Romana which is bustling with tourists, vino, and amazing pasta dishes! And there you have it! Miami has so much to offer and so many amazing restaurants and bars, so you cannot go wrong! We hope everyone has a wonderful weekend...now book those Miami Bachelorettes! 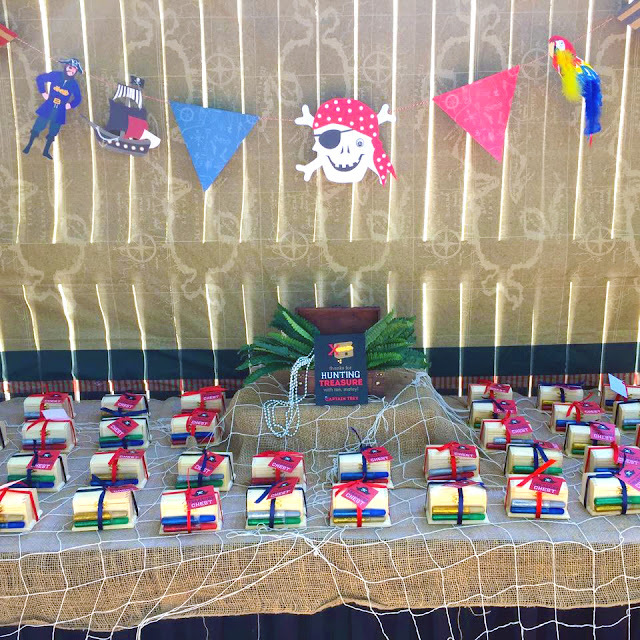 We're in the middle of one of our best wedding seasons yet (and have SO much wedding invitation goodness to share with y'all), but today we want to showcase another side of our business that doesn't get quite as much recognition as our weddings..small business branding!! 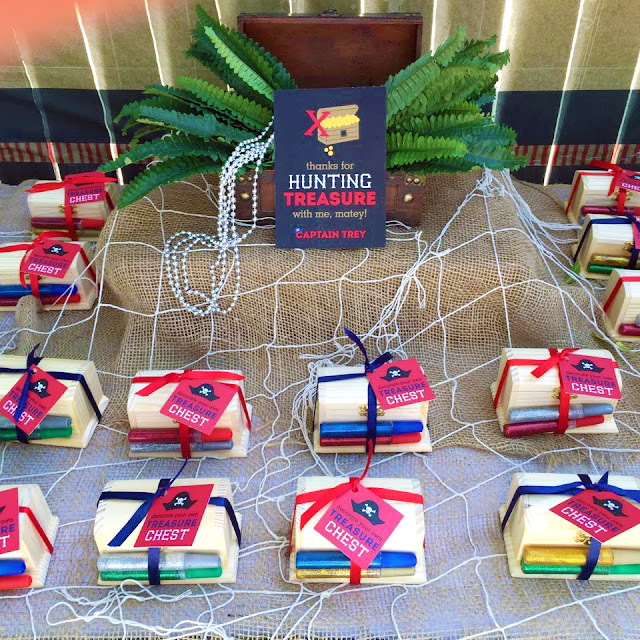 We have some amazing clients' who have stretched our creativity while branding their small businesses, so we want to start sharing some of these great companies. From one small business to the others we work with...we are so thankful for you all. 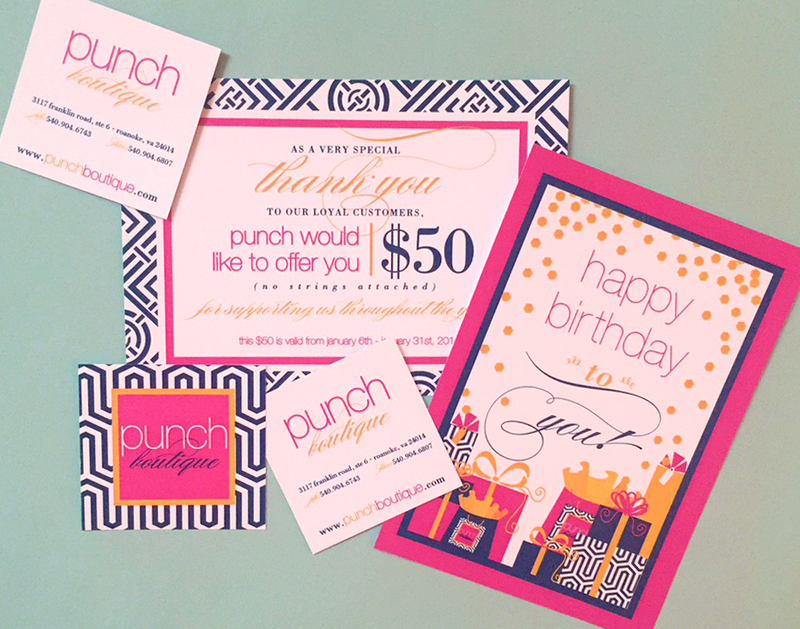 Today we are highlighting one of our original branding clients...Punch Boutique! We've been working with Punch Boutique's owner, Tammy, since she first opened Punch's doors in 2011. Located in Roanoke, Virginia, Punch Boutique carries the best of the best in clothing and accessories (we're talking Lilly Pulitzer, Mara Hoffman, Milly, Sail to Sable, Shoshanna, and Hunter to name a few)! 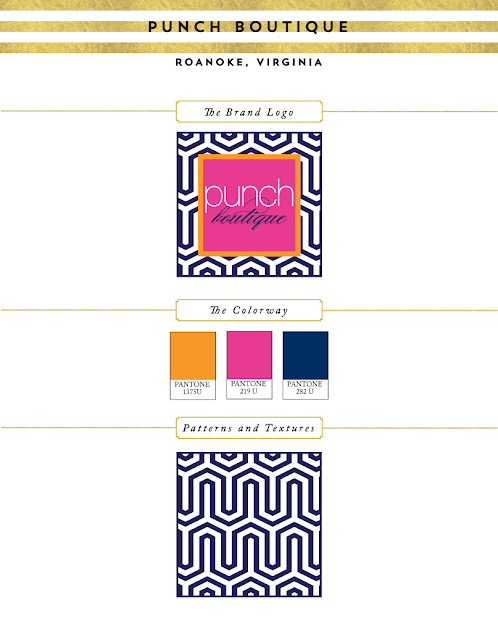 Tammy has a great eye for design, so we were excited to get started with the branding for Punch. It was important for the Punch Boutique brand to always stay on trend with their collection of fine designer lines. 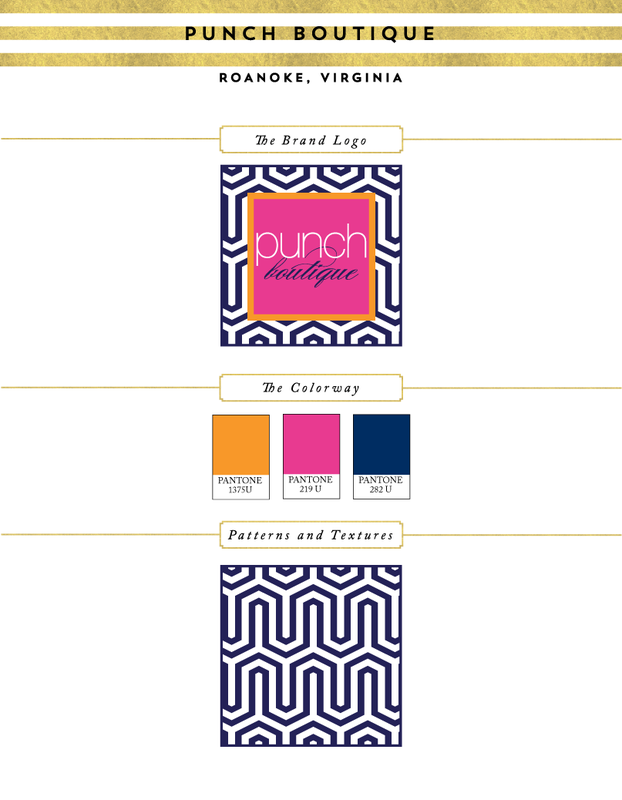 So we combined bright colors (inspired by Tammy's Floridian roots) with bold prints to really punch up their branding and keep Punch Boutique in style for years to come! We began with the logo design, and moved on from there to design their business cards, website, shopping bags, gift certificates, and more! Since then, we've helped Tammy design everything from Christmas cards for Punch to print ads featured in magazines and local newspapers. Take a peek at some of the items we've helped create! An assortment of items we've helped Punch Boutique design including their square business cards, birthday cards for their customers, and a happy new year card! 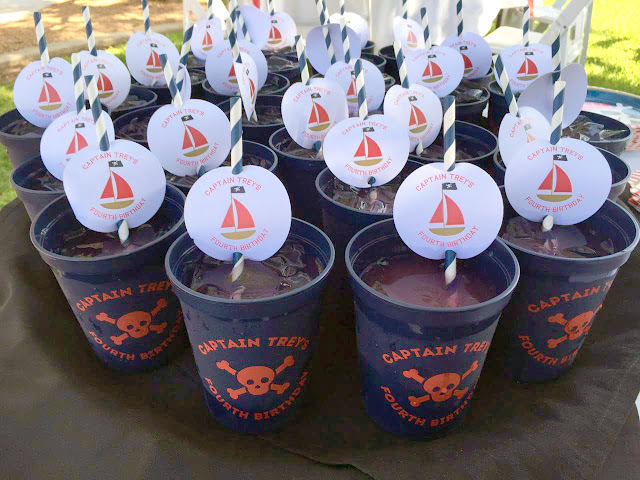 Whatever the occasion, Punch items are always swanky, fun, and stylish! 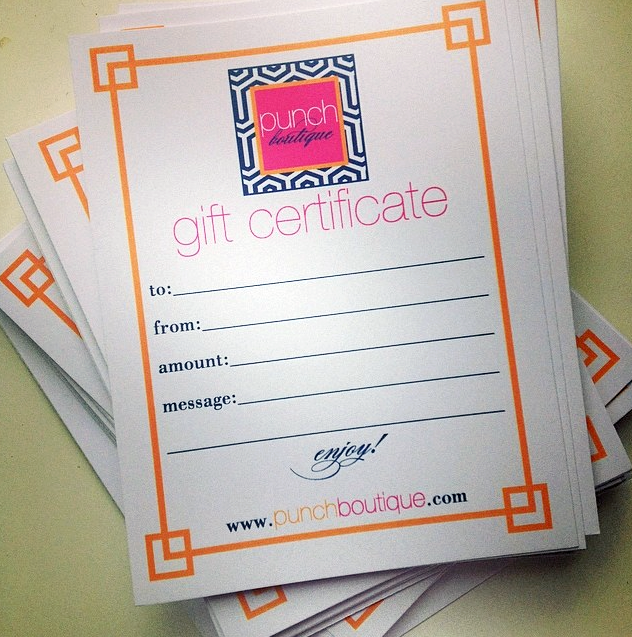 Who wouldn't love receiving a Punch Boutique gift certificate?! We love working on Punch clients' favorite promotion...Punch bucks!! 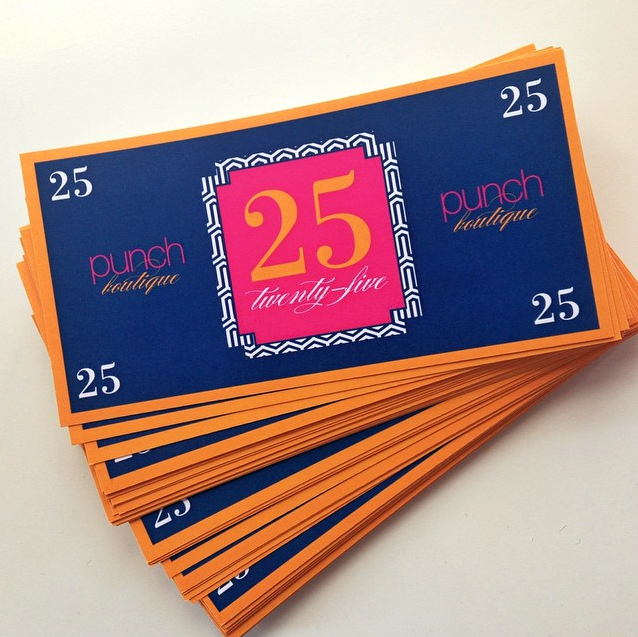 Given to Punch Boutique customers as a reward for shopping during certain times of the year, Punch bucks are always a huge hit! 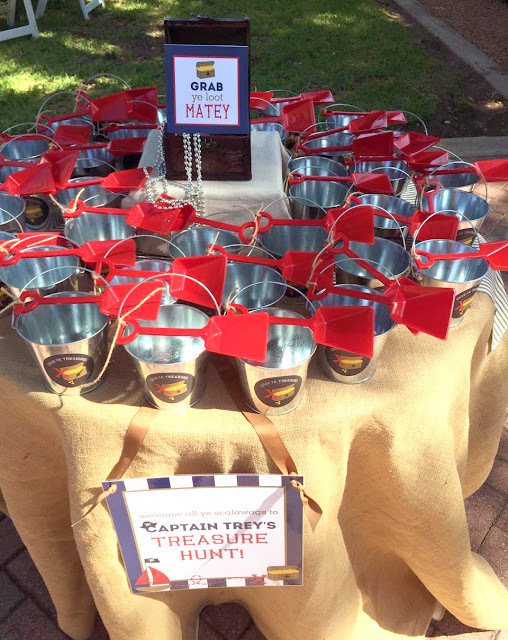 We're pretty sure that Punch bucks are more fun than real bucks! 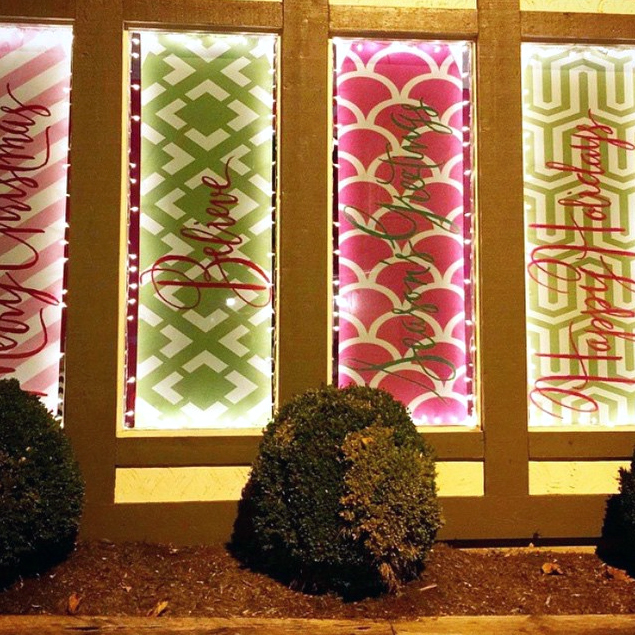 During the holiday season, we helped add some sass to Punch Boutique's windows with these adorable window signs!! Two different print ads we've designed for Punch! 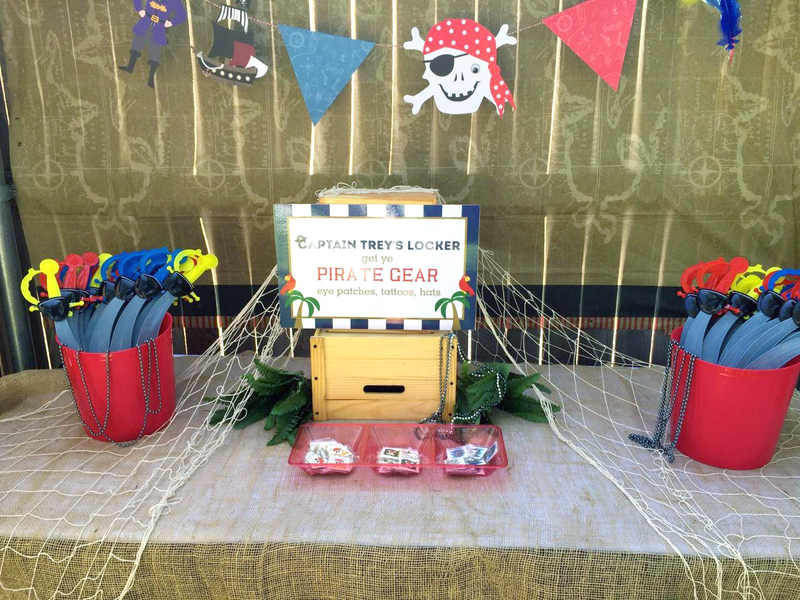 One features different summer fun clothing options available at Punch Boutique! The other ad showcases the different sale racks available at their New Years sale!! Not in Roanoke?! Punch Boutique also has a shoppable online store (also designed by us)! 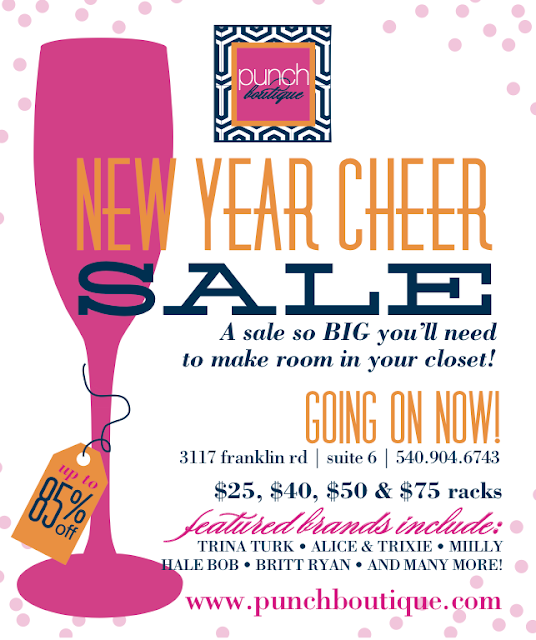 We've picked out a couple of our favorite things from Punch Boutique to help get your shopping spree started!! You can't ever go wrong with blue and white...so this Collins dress by Annie Griffin is our pick for an end of summer bash! Get one before they're gone...this party dress is currently on sale! Show off that summer tan in this adorable woodblock floral bathing suit by Trina Turk! We love the bright colors and bold floral pattern, so perfect for summer!! 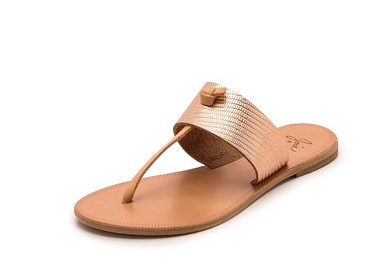 Paired perfectly with a fresh pedicure, these rosegold Nice Sandals by Joie will keep you stylish well into fall's warmer days!! It wouldn't be a proper round up without including some of our favorite Lilly Pulitzer pieces available at Punch Boutique! The Lilly Pulitzer Alexa Shift in prep green pink colony makes us swoon!! The perfect dress to flamingle during the end of summer! If shift dresses aren't your thing, don't fear!! 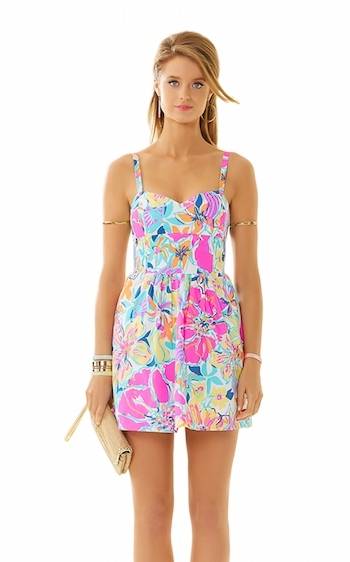 The Lilly Pulitzer Christine Sundress in multi besame mucho is here!! How amazing is the floral print?! We're obsessed! 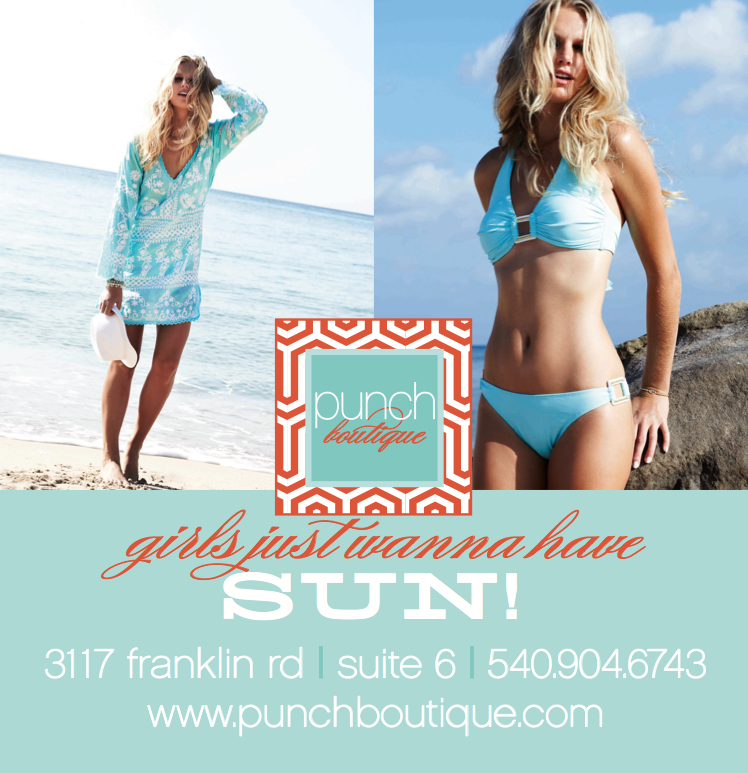 Visit Punch Boutique in person at 3117 Franklin Road in Piccadilly Square, Roanoke, VA! Or shop online at Punch Boutique's website! If your small business needs some rebranding, or if you're a business owner about to start your own company, we would LOVE to help with your small business branding! Please email custom@nicoandlala.com to get started!